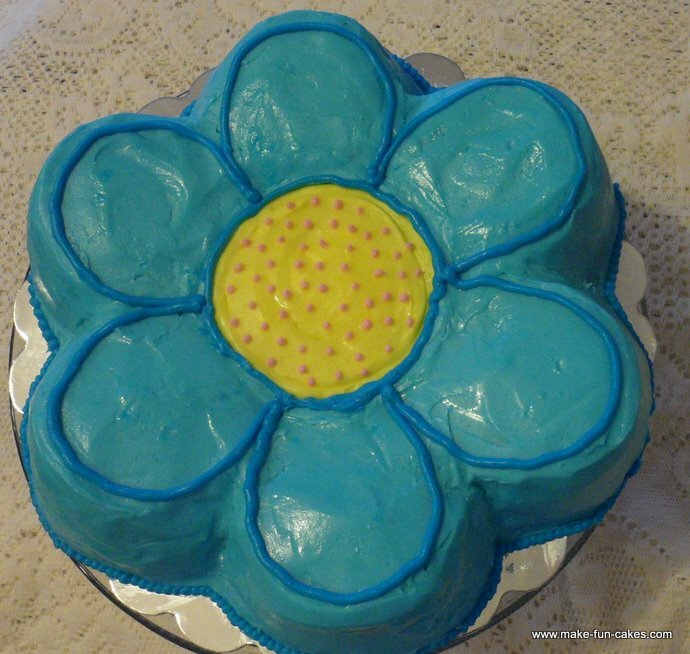 A flower birthday cake can be easy to make, adorable to admire and delicious to eat. 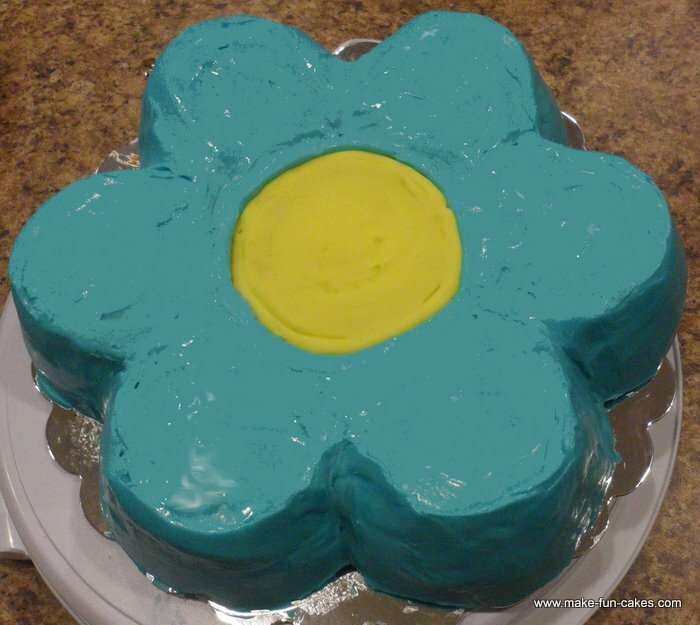 One of the more popular girl birthday cake ideas, this version of the flower cake is easy to make with a flower cake pan. 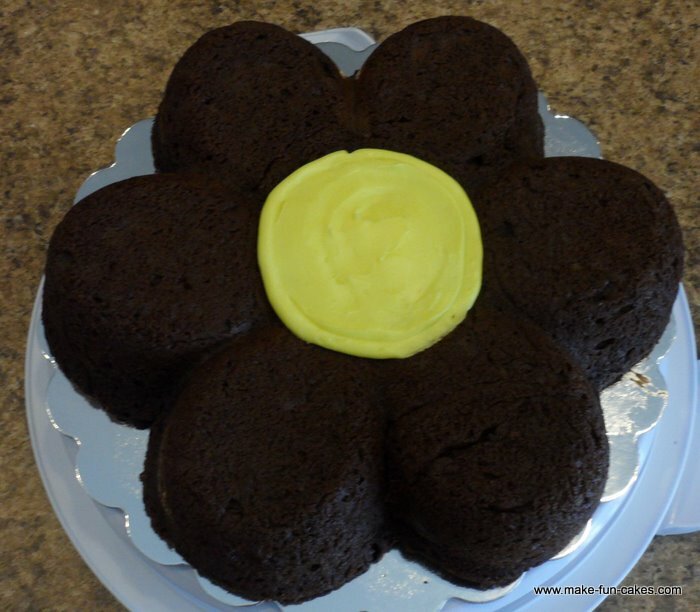 A flower shaped cake is not only a great cake for birthdays, but it also is a wonderful Mothers Day cake, baby shower cake, teacher appreciation cake or friendship cake. Experiment with colors and textures to change the look of your cake. This cake was simple to make, but when I delivered it, the birthday girl was so excited. I saw her later in the day at a soccer game and she told me again how much she loved the cake. A flower birthday cake adds the finishing touch to a flower-themed birthday party or baby shower. Guests will love it. Note: This cake pan produces a relatively thin cake, which does not make it ideal for adding a filling. Choose a great stand-alone cake recipe that does not need a filling to taste great. 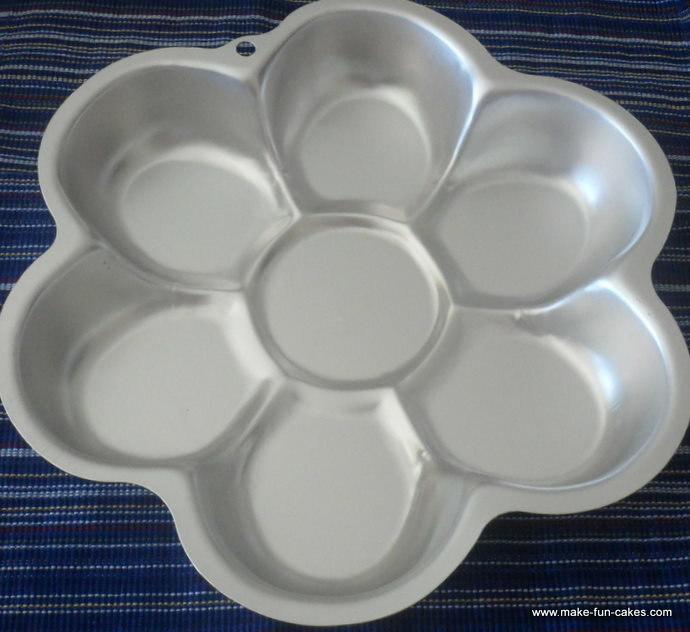 Thoroughly spray cake pan with nonstick baking spray. Be sure that no silver areas of the cake pan remain. Use a nonstick spray specifically designed for baking. This will save a lot of headaches when it is time to remove the cake from the pan. Mix up and bake your favorite cake recipe at 350 degrees for 30-40 minutes, until done. When cake is finished baking, set it on a cooling rack for 15 minutes. Turn cake upside down on the rack and cool completely. If the bottom of the cake is not level, cut off the excess “belly” of the cake so it will lie flat on cake board. Place cake on cakeboard. I like to freeze my cakes when working with them. Although this is not a necessary it helps control crumbs. Using Wilton tip #12 and the frosting for the flower center, first outline and then fill in the flower center. Use a small spatula to smooth. Crumb coat the rest of the flower with a small spatula. A crumb coat is a light layer of frosting that is another method to help control crumbs. Either freeze cake at this point or chill for 15-20 minutes until the crumb coat frosting has dried and crusted over a little. 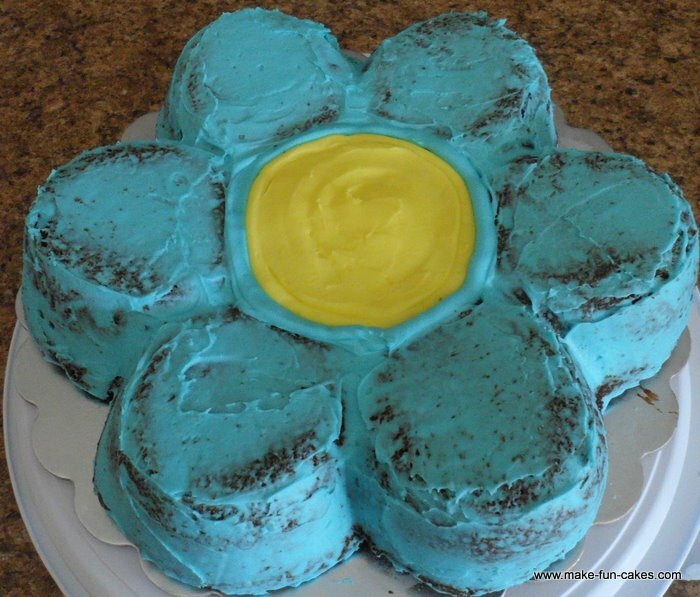 Use Wilton tip #12 and the main flower color frosting to outline and then cover the cake. Smooth frosting with spatula. 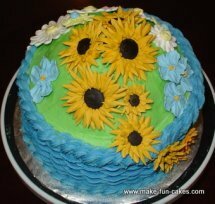 Outline the flower petals with Wilton tip #6 and the coordinating frosting color. Make small dots in the flower center with your preferred color and Wilton tip #3. Finish off the cake with a round border piped with Wilton tip #10. 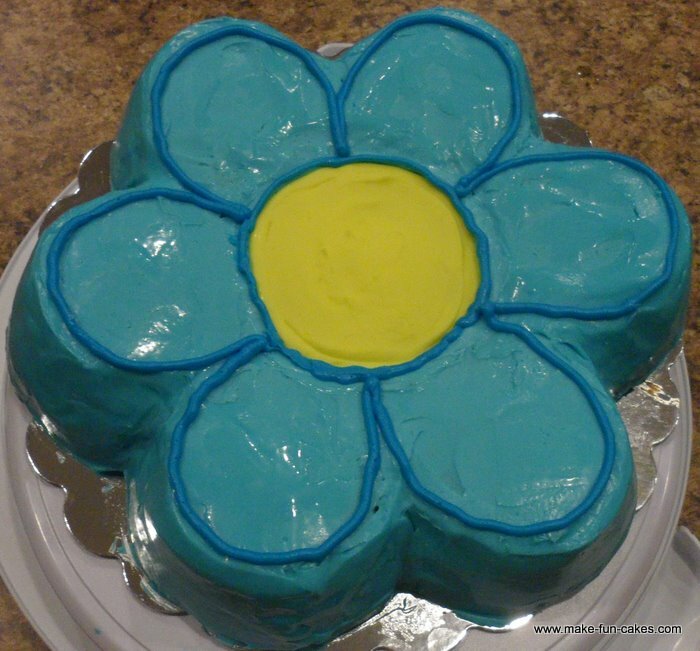 This easy flower birthday cake should not take any longer than about an hour to decorate, depending on your decorating skill level. 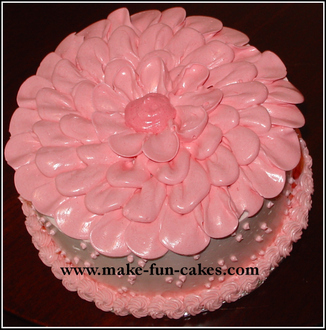 The most difficult part will be smoothing the frosting on the petals, since the cake is shaped rather than level. Brag a little! 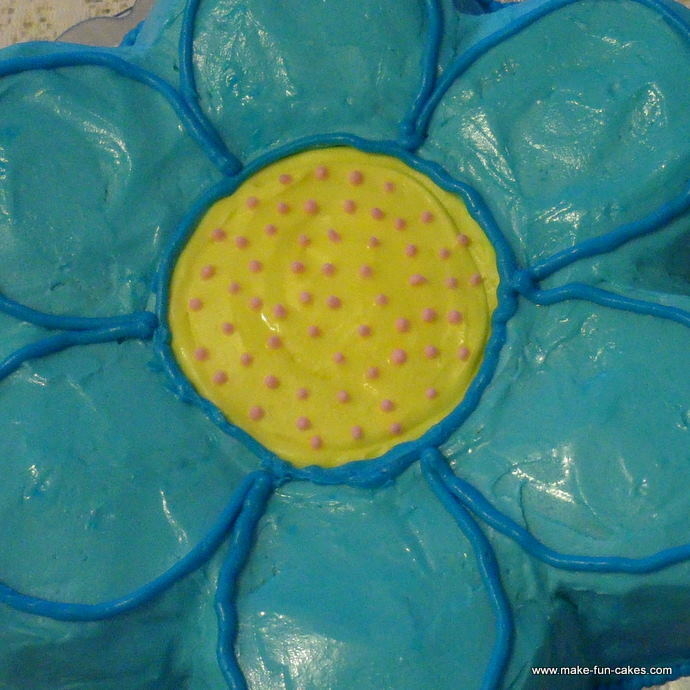 Our cake decorating community wants to hear all about the flower cake you made. What techniques did you use? Did you using fondant, gum paste or royal icing? What tips do you have that helped you in creating this cake? What fabulous pictures did you take? Please share them with us. Looking for a Different Flower Cake? Take a look at these other fun flower cake ideas.